Admiral Harriman Nelson (USN, ret.) was, by all appearances, extremely young for his rank. Although he appears to have come up the ranks quickly, there are real admirals who have achieved the same. Former Chief of Naval Operations, Admiral Elmo R. Zumwalt, Jr., achieved four-star rank at age 49, which made him the youngest four-star admiral in American history. 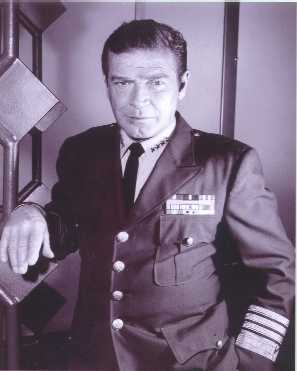 Nelson, as portrayed by Basehart, appears to have been in his late forties or early fifties as well. It is important to note, however, that Nelson retired as a Vice Admiral. He wore three stars on his collar for the first few episodes, and then, without explanation, he was suddenly promoted to four-star rank. One theory suggests the post-retirement promotion was earned for saving the President's life in the episode "Hail to the Chief." These things (post-retirement promotions) have happened in real life. A few years ago, for example, an elderly African-American three-star general, long retired, was promoted to four-star rank by President Clinton. Although we know that Admiral Nelson once served in the first nuclear sub, the USS Nautilus (where he met his friend, Commander Lee Crane), details of his naval career are sketchy. Many suspect that he was born in or near Boston, although he doesn't have a typical Bostonian accent. We know that he has been a professor of Marine Biology and Chemistry, and that he, of course, designed the Seaview and various weapons systems aboard. In the episode "Day of Evil" it was also revealed that Nelson was also one of the designers of the Fail-Safe system. What is not known are the details regarding his ascension through the ranks and the other ships he served in or commanded. Nelson, a great innovator, seemed to lack the parochial bias that his real life counterparts often suffer. Although he was obviously a submariner, he was also a qualified aviator who frequently piloted the Flying Sub. He even landed FS-1 on the deck of a carrier, and the USN would never allow anyone but a currently qualified naval aviator to do so. He also appears to be a qualified parachutist, suggesting that he may have a "Special Warfare" background. That seems consistent with the fact that he is frequently chosen for dangerous covert missions in enemy territory. Although at times he was known to grumble, his style of command was modeled on the "New Navy" approach in which men are led by inspiration, confidence, and by personal example rather than by strict discipline and a rigid command structure. Aboard the Seaview, Nelson is addressed in respectful terms by all hands, but no one seems to get carried away by formality, either. His scientific genius is unquestioned, as is his character. He was known for getting things done, and done well. Nelson was a patriot, a scientist, a warrior, a scholar, an inventor, and a man of principle. Very few real admirals could match him in all these areas. Was Nelson a true hero? Probably, yes. But what's more, he seemed approachable, and perhaps even modest. It has been said that all great men are modest. By this definition, and in light of his considerable accomplishments, Nelson truly was a great and honorable man. Roger Thompson is a Fellow of the Inter-University Seminar on Armed Forces and Society, and a former researcher with the Operational Research and Analysis Establishment at National Defence Headquarters, Ottawa, Canada. He is an internationally recognized authority on combat motivation, military sociology, regular/reserve total force issues, and military bureaucratic politics. His seminal work on combat motivation in naval forces was endorsed by the US Chief of Naval Operations, SACLANT, CINCPACFLEET, best-selling novelist and submariner the late Captain Edward L. Beach, US Navy (Retired), and the German, Australian, Chilean, Italian and Spanish chiefs of naval staffs. His work in this area was translated into Spanish under the authority of the Commander-in-Chief of the Armada de Chile, Almirante Jorge Martinez Busch. He also received a medallion from the Chief of Staff of the Italian Navy, Admiral Guido Venturoni, for his contribution to military sociology, and his work has been acknowledged by General Colin Powell as well. His 1994 MA thesis Brown Shoes, Black Shoes and Felt Slippers: Parochialism and the Evolution of the Post-War U.S. Navy was published by the US Naval War College in 1995, and again by the Mine Warfare Association in 1997. The original publication was endorsed as "essential reading for professional naval officers" by the late former US Navy Chief of Naval Operations, Admiral Elmo R. Zumwalt, Jr.
Thompson's contribution to military studies was recently summarized by the famous military sociologist, Dr Charles C. Moskos. Moskos, whose scholarly writings have been published in 19 languages, said: "Simply put, Roger Thompson is the leading scholar in the sociology of naval institutions. His book, Brown Shoes, Black Shoes and Felt Slippers: Parochialism and the Evolution of the Post-War US Navy, is a classic in the sociology of the armed forces and civil-military relations. It was my honor to give an endorsement to this book upon its publication." Moskos concluded that Thompson is a "most remarkable scholar and teacher." Thompson has presented papers on military studies at international conferences sponsored by the Turkish Military Academy and York University, and has been invited to present a paper at the United States Naval Academy. His new book Lessons Not Learned: The US Navy's Status Quo Culture will be published by the Naval Institute Press in April 2007, and features an afterword by best-selling author Colonel Douglas A. Macgregor. Professor Thompson can be contacted through his homepage.